Making pasta is one of my favorite things to do. I am always looking for new shapes to try, especially those you can make with little or no special equipment. 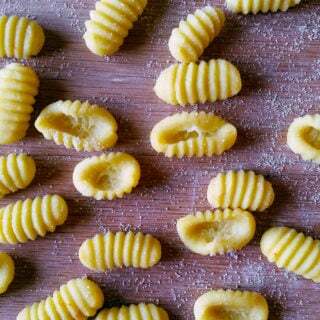 Malloreddus, gnocchi from Sardinia, fit the bill nicely. All you need to make these is either a little gnocchi board, which costs $5, or hell, roll the dough off the tines of a fork. I use the board, which makes them a bit prettier and more uniform. The pasta is made from durum semolina and water, with a little saffron tossed in to make the pasta yellow. 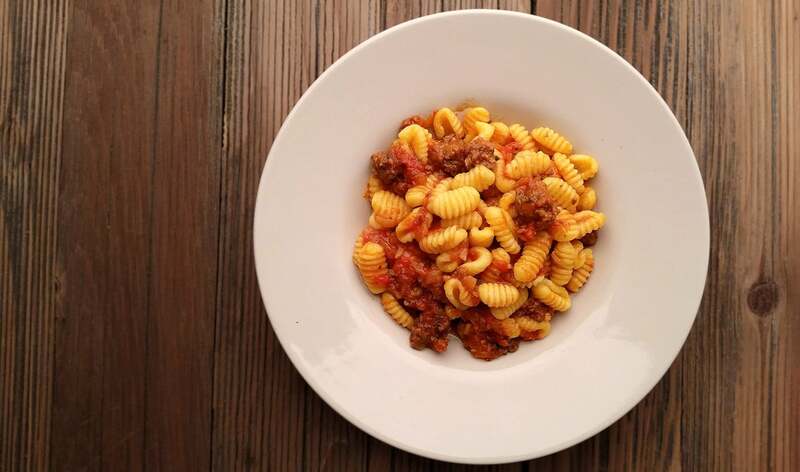 The ragu is a simple tomato-and-pork pasta sauce, also with a little saffron in there. I used ground wild pig, but any ground meat will work. What you get is just plain comfort food. Nothing challenging, everything satisfying. Tomato, olive oil. Pork, saffron, and pasta with a nice chew to it. These little pasta dumplings are fun to make and pretty easy, as is the ragu. Use ground pork, or any ground meat you like. Chop up mushrooms for a vegetarian version. Serve a light red wine or a dry rose alongside it. Start with the pasta. Crumble the saffron in the warm water and let it bloom a few minutes. Mix the flour and salt together in a large bowl. Drizzle the olive oil over this. Pour in the water, making sure you get as many little saffron bits into the dough as possible. Knead the dough for 5 minutes, then wrap tightly in plastic wrap. Let this sit on the counter for 1 hour. Or, if you vacuum seal your dough, you can proceed immediately. Cut the dough into 8 equal pieces. Keep the pieces you aren't using under the plastic. Roll a piece into a snake about 1/2 inch thick, or a little less. Cut off bits of dough about the size of your thumbnail. Using your thumb, roll each bit off a gnocchi board or off the tines of a fork. Set each dumpling on a baking sheet dusted with more semolina. Repeat with the rest of the dough. After you knead the dough and are letting it rest, you can get the ragu started. Put the sausage and olive oil in a large pan and set it over medium-high heat. Brown the sausage, breaking it up into bits as you go. Add the onion to the pan and cook the until it softens. Mix in the tomato paste, and, when it is incorporated, add the saffron, bay leaf, rosemary. Take each whole, peeled tomato and tear it up over the pan, letting all the juices fall into the pan. Do this with the whole can, then pour in the remaining contents of the can. Rinse the can with a little water and pour that in, too. Let this simmer uncovered while you make the pasta. Stir it occasionally. When the pasta is done, get a large pot of water boiling. Add enough salt to make the water taste salty. Boil the pasta until it floats, then for 1 minute more. 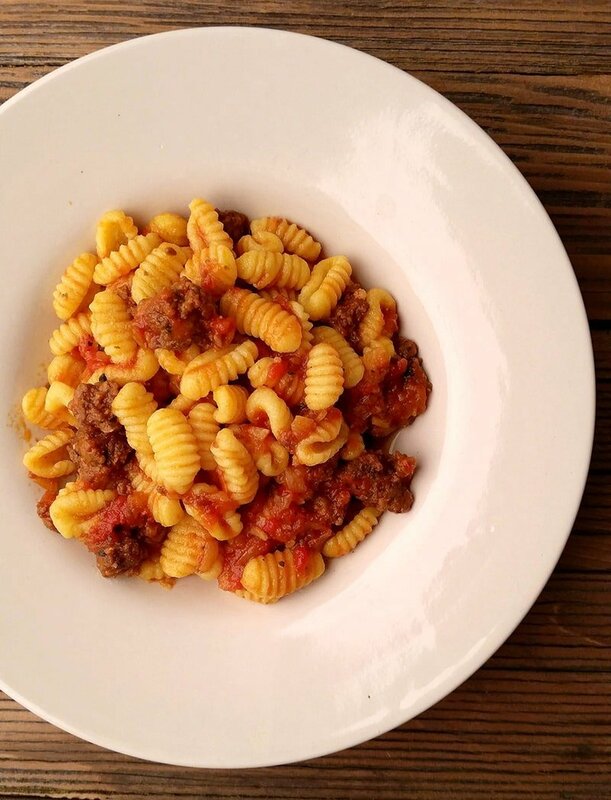 To serve, put a little of the sauce in a big bowl and add all the pasta. Toss to combine. Serve with a little more sauce on top, garnished with grated cheese.